Joining the movement against the Citizenship (Amendment) Bill 2016, a number of organisations on Tuesday staged protests across the State with a demand to withdraw the Bill. 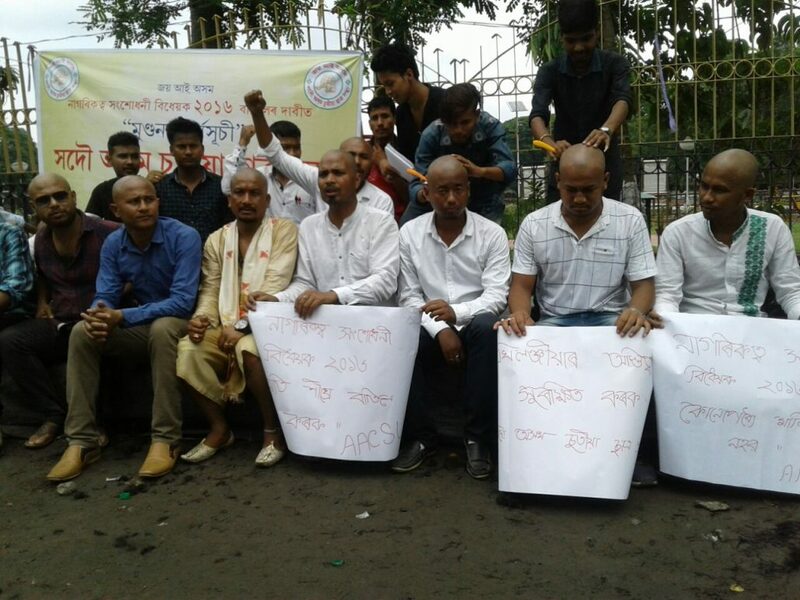 As part of their protest, several leaders of the All Assam Chutia Students’ Union (AACSU) tonsured their heads in protest against the Central government’s move to implement the Bill during a protest demonstration at Guwahati’s Dighalipukhuripar. The protesters demanded the Central government to provide constitutional safeguard to the indigenous people of the State. The AACSU leaders also demanded implementation of the historic Assam Accord to identify and deport immigrants from Assam. AACSU chief advisor Jyotiprasad Chutia, advisors Bipul Chutia and Madhumadhab Saikia, executive presidents Samiran Bora and Rajani Chutia and general secretary Mahen Bora were present in the protest programme. In Golaghat district, Dhansiri sub-division Krishak Mukti Sangram Samiti (KMSS) activists also tonsured heads demanding immediate withdrawal of the Bill during a protest programme at Sarupathar town. The activists also restricted State Bharatiya Janata Party (BJP) president Ranjeet Kumar Dass’ entry to the region. On the other hand, Sonitpur Journalists’ Union (SJU) staged a one-hour sit-in demonstration at Court Chariali in the town against the BJP-led Central government’s move to bring in illegal Hindu Bangladeshis to Assam by implementing the contentious Bill. Asomiya Surksha Samiti and Sangrami Mancha also staged a sit-in-demonstration in Nalbari district against the BJP-led Central government’s move. Brihattar Asomiya Yuba Mancha and Brihattar Asomiya Mahila Mancha activists also tonsured heads demanding immediate withdrawal of the Bill during a protest programme at Guwahati’s Dighalipukhuripar on May 21 last.